Fall is the perfect time to upgrade to a more modern and efficient thermostat in time for winter. If this week's crisp temperatures are any indicator, fall has arrived, which means winter is just around the corner. Therefore, there are a few mandatory chores home owners should take care of before the weather gets bad. From resealing your driveway to upgrading your thermostat, here's a list of important, last minute projects that will have your home ready by the time winter hits. Let’s begin with the part of the home that gets hit the hardest by the weather: The exterior. If you've put off sealing or repaving your cracked and unsightly driveway, now is the time to do it. Not only will the cracks you already have get worse, they will also expand and form new cracks as the temperature plummets. Winter weather can wreck havoc on wood patios, decks and furniture. Make sure to get all your staining and sealing done before the snow flies. Often taken for granted, gutters do more than clog up with leaves. When properly maintained, gutters will keep roofs from leaking, protect your home's foundation and prevent floods. Make sure to repair, maintain or upgrade your gutters as needed before the weather changes. For tips on how to select the right type of gutters, click here. Now, lets move on to the home's interior. When it comes to the inside of the home and winter weather, keeping warm and conserving energy are usually the top priorities. Here are some tips that will help you do both. Replacing your HVAC systems filters will not only improve indoor air quality, it will also help the system to run more efficiently. 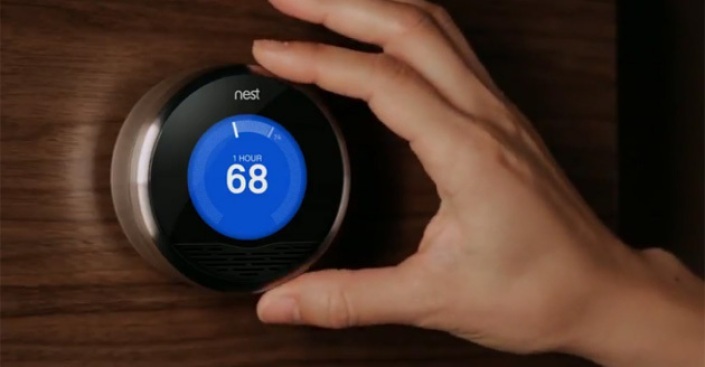 A new thermostat can help cut down on your energy bills while keeping your family comfortable at the same time. More modern units have sensors and timers that help distribute the heat in your home where it’s needed most. Using caulk, seal up drafty spots on windows and doors around your home. Eliminating drafts in your home can greatly reduce your home's energy without sacrificing comfort. Finding out you have a broken furnace is better done while it’s warm, rather than the first cold night of the year. If you do flip the switch and nothing happens, we are here 24/7 to help with all of your HVAC needs. Some of these projects are easily done by the homeowner, while others most likely require the assistance of a trained professional. Michael & Son can help you with any job around the house, no matter how big or small. Call us today and set up an appointment with one of our friendly, professional technicians. And be sure to check in with us for more helpful home tips. If you are more of a hands on learner, sign up for our free DIY workshops being held on the first Saturday of every month.